Imagine - warm tropical climate, gentle sounds of waves washing ashore, palm trees swaying in the breeze, panoramic views, and the perfect accommodations - is there anyway else to experience Hawaii? This two bedroom, two-bath condominium gives you all of that and more! Updated with stainless appliances, and a full make over, including granite countertops, and tiled floors throughout, this unit is a prime destination for an absolutely blissful vacation! An immaculate beautiful ly decorated condo perched on the shore with a stunning view of the ocean. There are waves crashing on the lava rocks at your feet, miles and miles of ocean palms trees in the breeze a perfect island retreat. The Condo is very well equipped and stocked. The bed is oh so comfortable, and the waves lull you to sleep. 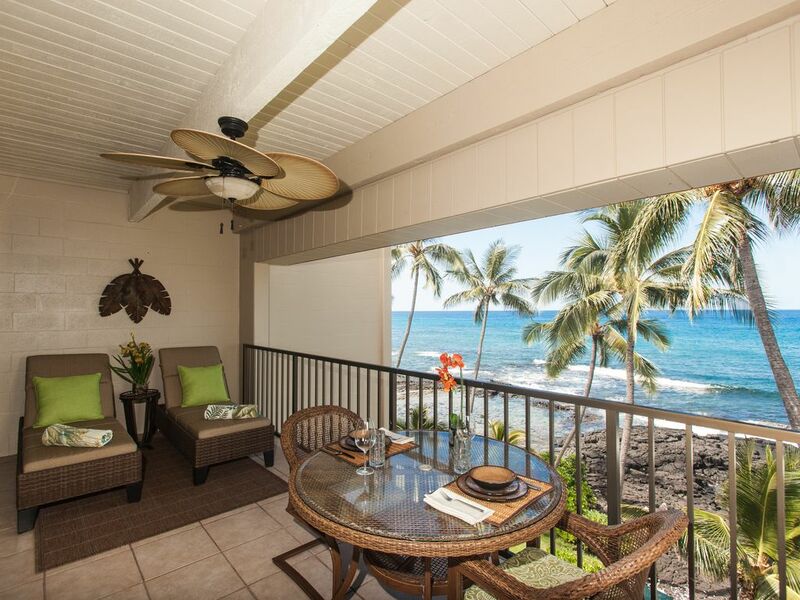 It is well located about 2 ½ miles from shops and restaurants in Kona . Da Poke Shop the best poke is on the grounds, there is a convenience store across from the street and it is about ½ mile from Ali’i market place. But the best restaurant? Well as the guest book so often said dinner with a spectacular sunset or breakfast with the ocean view on the Lanai can not be beat. After years of coming to the islands mostly Maui we have found a bit of heaven here. Thank you Holly for such a wonderful experience. We definitely will return and stay longer next time. A great place to tour the Big Island or just to sit back and enjoy the view. Sunsets provide all the best in viewing entertainment. Though there are lots of restaurants within an easy drive, the BBQs onsite and the oceanfront dining can't be beat. Comfortable beds make for a truly restful sleep. My spouse who has back problems woke up without any complaints. Mahalo! Mahalo for you great review, and taking the time out to submit it. Hope to see you again! We really enjoyed our stay at this oceanfront condo in Kona. Our bedroom was facing the ocean and the sound of the waves crashing was so exciting. The views were excellent, you could see turtles from the lanai and watch the surfers. The condo is stocked with everything you could possibly want, luxury sheets, really comfortable beds, plenty of towels, and beach towels. Even really nice comfortable folding beach chairs, umbrella to use when you've had enough sun and the kitchen was pretty well stocked with the essentials when we arrived. You never know if you are going to even have salt and pepper in some rentals, but this unit had almost everything, including a free sample of Kona coffee for your first morning, only to mention a few things. Good parking under the unit, an elevator for moving luggage, very nice swimming pool and hot tub, even though we were too busy to use them. So close to all activities and such a great place to return to when you need to relax and catch your breath. I would definitly stay here again. Thank you for thinking of everything. Mahalo Linda for your wonderful review of our property!! So glad you enjoyed your visit here and do hope that you might return for a second stay sometime!! We loved this place. We wil definitely be back. Probably one of the most private condo we have ever stayed. The waves and views were the best. So glad you enjoyed your stay! I appreciate you taking the time to submit your review. We loved staying in your condo! Mike and I really appreciate the upgrades in appliances, towels, and other amenities provided to us. The condo size was super spacious and very quiet and clean. The lanai was absolutely fantastic!!!! Location of condo was super convenient for pickup for tours or to boat ramp and restaurants. We hope to come back very soon because we enjoyed the property so much! The only suggestion would be for instructions on how to start the coffee maker. There is a GREAT snorkeling beach just two miles down the road!